t*rexes and tiaras: Black Friday Favourites.. I didn't think it would be right to pass up an opportunity to share my favourite Black Friday sale picks with you, so here we go..
001: Aspire Style's Black Friday sale section is the place to snap up this Emily and Fin Florence dress - love the cute print on this. 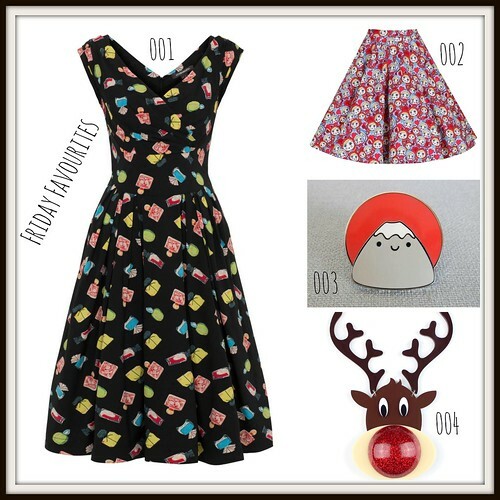 002: Lindy Bop are adding more and more items to their Black Friday sale, including this lovely matryoshka print skirt. 003: Marceline has 20% off everything on her website, with up to 40% off some selected items. This little Mount Fuji enamel pin is one of them. 004: Amazing acrylic jewellery makers, La Vidriola are offering 20% off their site until 29th November, with free gifts if you spend over a certain amount. This Rudolph necklace is amazing - his nose lights up! 005: Joanie have all kinds of reductions going on - their Black Friday sale is up to 50% off, so head over there and find your Christmas party outfit - sooo many pretty things! 006: Damaris and Mimi Holliday are fast becoming a site I drool over most days, so I was super excited to see that they have some huge Black Friday reductions. 007: Yoshi are offering 20% off all full price items today only with the code THANKYOU20 and I'm so tempted by this jammy biscuit bag. 008: Collectif have 25% off everything in their own brand lines, until midnight on 28th Nov. This dress has been in my dreams for so long now - perhaps it's time to take the plunge! 009: Playful Promises have a huge sale on at the moment - I might need to be restrained. 010: Little Moose are offering 20% off everything with the code LMBF20 until midnight on Monday. 011: Kate Spade also have 20% off your purchase with the code SKYLINE. Also ends midnight on Monday. 012: You can pick these Irregular Choice x Alice heels up from Schuh with 32% off in their Black Friday sale. Hannah from Doodleheart is offering 25% off her prints until tomorrow with the code "BLACKFRIDAY16". For fabric lovers, there's up to 70% off in Miss Matatabi's fabric shop on Etsy, whilst The Village Haberdashery have 25% off for today only with the code BLACKFRIYAY25. Searching for wedding shoes? The code BLACK20 will get you 20% off shoes on Elegant Steps. Vendula London have 30% off selected products on their site until Monday. Book of Deer have some beautiful clothes on sale in their Black Friday selection. Sugar and Vice have 20% off the site with the code BLACKFRIDAY, which ends midnight tonight. Have you spotted any amazing deals? 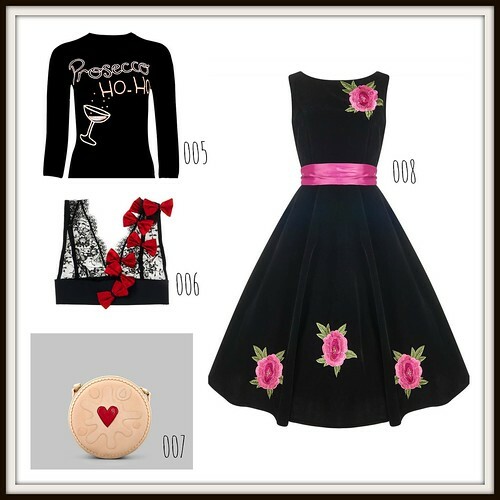 Lovely outfits and picks, thanks for sharing!